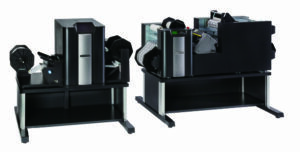 Graphtec GB has introduced the new LCX1000 label printing and finishing system. The LCX1000 consists of two separate machines: the DLP1000 (a high-speed digital printer) and the DLC1000 (a digital finishing machine that provides dual laminating and customised cutting functions). The system enables fast and smooth work transition between the label printing and finishing processes and incorporates a number of design features that, according to Graphtec GB, set it apart from other similarly positioned label printing and finishing solutions. The DLP1000 is a high-resolution (600 x 2400dpi) printer, providing a maximum speed of 124mm/sec, a maximum printing width of 152.4mm (six inches) and a media-handling width of 216mm (8.5 inches). It will process a wide range of different substrates, including gloss, semi-gloss and synthetic paper and PET film in white, clear and silver formats. Based on Graphtec’s proprietary cutting technology, the DLC1000 is an all-embracing digital print finishing solution offering multiple functions to enable continuous label production. Unlike most rotary cutters, the DLC1000 does not require expensive cutting dies, thus contributing to the overall cost-saving efficiency of the LCX1000 system. With the laminating function, the DLC1000 imparts a label finish that provides optimum resistance to chemical and environmental degradation, image deterioration and abrasion. The LCX1000 is GHS (Global Harmonisation System) compliant and supplied with dedicated design and production software.